In Telescopes Eyepieces Astrographs Smith, Ceragioli, and Barry discuss “rejuvenating” a standard all-spherical SCT by “respacing” the corrector plate – relocating it toward the primary’s radius of curvature – which results in a marked improvement in optical performance. Respacing the corrector doesn’t quite reduce the coma as much as in the EdgeHD, but it does provide a very significant improvement, and shows better on-axis performance than the EdgeHD. I’m considering this approach for my older C14. If I apply the same factor to this instrument, this would result in a forward displacement of the corrector of ~ 417 mm. The increased OTA length is of little consequence to me because the instrument will be permanently mounted, and I’d consider use of a curved spider v. straight to reduce diffraction. Any feedback, or critique of my methodology for figuring the respacing distance, would be appreciated. I don't think you can simply move the corrector. If I am not mistaken, the spherical aberration correction of the system is only perfect for a very specific spacing of the primary mirror to the corrector. If you move the primary closer to the corrector, I believe that it will induce spherical aberration. The corrector would have to be made to a different power, so in a new design, this could be done, but I don't believe that you could simply modify an existing telescope simply by moving the corrector and installing a spider to support the secondary. Next, unless you could change the size of the secondary, I don't know how the system performace could improve on axis. The current system is already perfectly corrected for spherical aberration and the secondry would not be any smaller. And then you have the issue of the secondary mirror support. Not only would you have about the same size secondary mirror, but now you would also have to add 2% contrast loss for the secondary support vanes. And if you did not change the secondary to primary spacing, the tube would not be any more compact than it is today. So, you already have a system that is fully corrected for spherical abberation and you won't get a smaller obstruction, and you won't match aplanatic performacne of the EdgeHD design. If you are willing to live with a longer system, why not just build a classical cassegrain? But you may want to check on this. I am pretty sure that the power of the corrector would have to be increased quite a bit to get the desired outcome. And there are numerous possibilities for SCT design, but all of them offer some compromise that would seem to limit them from ever being commercially produced. While you may not care about increased size, many people are attracted to the commercial SCT for exactly that characteristic. 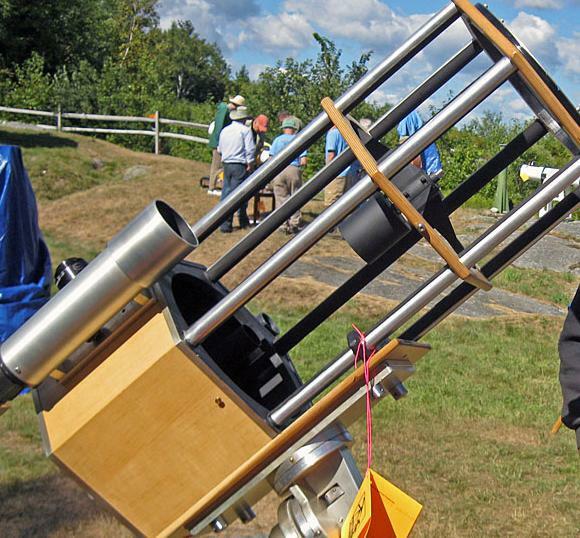 If you are willing to build a custom SCT though, I recommend the book "Telescope Optics". In this book, they diagram many different possible configurations and have the formulas needed to determing he power and curve of the corrector based on the speed of the primary and the desired seperation. Chapter 21 has all of this info. If this is indeed the case, then by the time you pay someone to fabricate the necessary power corrector, you may just want to consider moveing to another design completely. If packaging is of no consequence to you, there are many better designs than the standard SCT and while it is difficult to get the off axis performance of the EdgeHD without asperizing mirrors and using correctors (and there are other full aperture correctors besides the Schmidt!) then the sky, and your checkbook are the limits. In SCB's write up, they intentionally describe working with the existing elements of an sct and only changing the corrector spacing. So presumably it will work as the OP intends. I don't know of anyone doing this but I'd be interested to see the result. It wouldn't be easy and it would need to be done well, so that the corrector can be well centered for collimation and held in place. You would also need access to the secondary spider for collimation - through a hole in the side or something. You can't just scale up from the 8" because each sct size has a different f/ratio primary - but I don't know how critical the spacing is. I think the closer you are to the radius of curvature the better. It's a stop shift - shifting the pupil while introducing the same compensating spherical aberration. I would definitely not do this for a system imaging out in the wind because of the greater length - but in an observatory on a good mount - I'd be interested to see how it goes. It should reduce/remove coma, but the field curvature will still be there - so Edge still has an advantage, while also being compact - but it does use added lenses. This was done by a couple of well-known astrophotographers back in the 90s. It can indeed be done, but it is not a trivial operation, and that is why it never caught on. Part of the fun is providing a mount for the secondary mirror. Of course, if you are highly mechanically inclined the sky is the limit. For most of us? Sell the C14 and get an Edge. In theory, the secondary could be mounted on an extension back from the corrector, thus avoiding spider vanes. Something clever for collimation access would be required in either case. Well, there are several problems with trying to mount the secondary on the corrector. Most notably, the edge of the hole in the corrector now becomes a diffraction source. 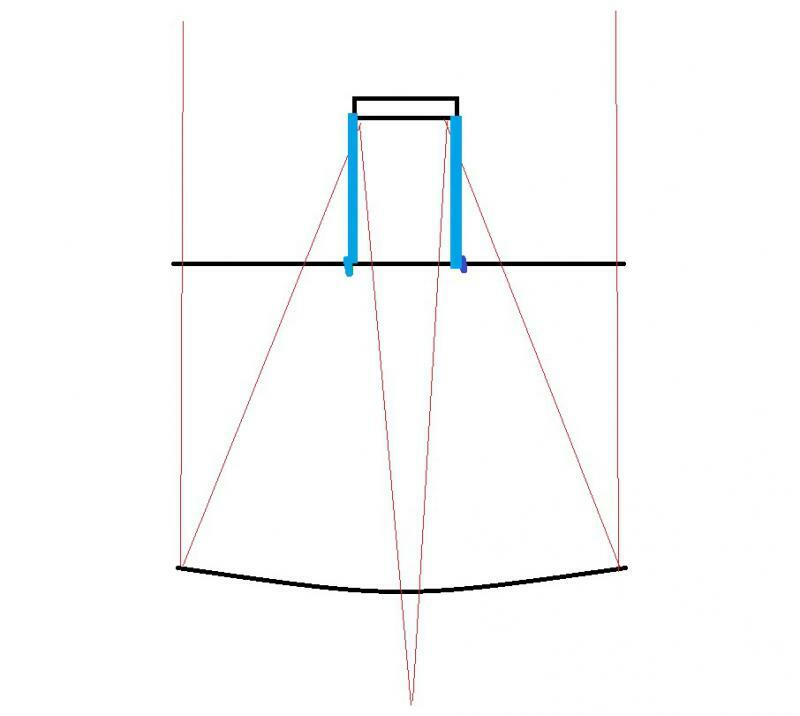 Remember, the f/2 light cone converges on the secondary behind the corrector, so the hole only needs to be large enough to support the secondary baffle. If the corrector is moved in front of the secondary, hole in the corrector may not be the same diameter as the light cone that is converging, so now you have a diffraction source. And any spider that was used in the original hole would still intrude into the light cone to the extend that the light cone is bigger around than the hole in the secondary and any support struts that might be employed. In essence, you would not only have the diffraction of the support struts themselves, but also the diffraction caused by the edge of the inside diameter of the secondary mirror mounting hole in the old corrector. Now this little bit of added diffraction of the hole edge itself could likely be ignored, but you could not so easily ignore the diffraction of the posts or columns or whatever you choose to call them would have on the light cone. Only that the reason that the commercial vendors are never going to do it is because it abandons much of what makes the commercial SCT great, which is its compact, robust, stable design. A modified design might be great for a permanently mounted scope, but the SCT makers sell to the mass market. They are not going to produce a design that is so specialized. ATMs though have a long history of successfully modifying different designs to suit their purposes. In this case though, I don't see any meaningful improvement over the EdgeHD design. And as the old saying goes, if it ain't broke, don't fix it. But I encourage the OP to take the plunge if he feels there is sufficient promise in the modification to make it worth his time. I would urge him to spend a bit of time with a ray trace program first though. Celestron has graciously published the spots for the EdgeHD and it is an amazingly good system. I don't at all see what the OP will accomplish by these changes but some time spent with a ray trace program will answer these questions (though it is important to mention that ray trace programs totally ignore diffraction either from the spider vanes of from obstructions.. They treat light as rays, and not waves). Here is a diagram that shows the problem. As you move the corrector further forward, the hole in the corrector becomes smaller in diameter than the outside edge of the converging light cone. The "Posts" (shown in blue) would have to be much thicker to support the side load than spider vanes would need to be. So now you have tick posts extending deep into the outside fo the light cone. The diffraction of the edge is also a factor but because it is curved, you would not see it in the same way that a curved vane spider spreads out the energy. But now you have a circular edge that is perhaps 50% of the diameter of the light cone. So, you have a 2% additional obstruction for a traditional spider, then you have maybe an additional 1% for the diffraction of the hole itself. Using posts would likely add much more than 2% though, so total induced diffraction could be up to 4% to 5% over the current SCT design. And I still believe that for high resolution obserging, the spherical aberration would change enough to lower contrast. For imaging, it might not matter though, and if the OP only wants to image, then diffraction of the system is far less important. You could park a can of beans the secondary location and still image. What the authors in the Telescope Eyepiece and Astrographs are states is to keep the secondary in it's original position and the move the corrector away from the primary not towards it. When the corrector is located at the ROC of the primary, coma will be corrected but at the same time the diameter of the primary will need to be increased to full illuminate the field of view. So by moving the corrector forward from it's original position by a factor of 27% of the ROC of the primary your balancing field illumination and coma correction. Here is a picture of Bob Pfaff all spherical 12" SCT that he displayed at Stellafane a few years ago that shows the concept. The secondary is located on a spider and the corrector positioned at the ROC of the primary. I can see that a successful implmentation of this idea rapidly diverges from the notion of adapting the optical set from a beaten up C8. Thanks Eddgie for your comments. In the back of my mind I'd started to consider what compromises would be inherent in moving things around, such as baffling, illumination, diffraction effects, but chose not to bring that up since the thread was not getting especially technical, beyond the reference offered initially by BYoesle. Thanks for posting that photo, in my mind, this optimized SCT has seemed more like a Newtonian in construction than an SCT. Did Bob Pfaff use standard Meade Optics? Bob designed and made his own optics including the corrector. The primary and secondary are both spherical and system fully corrected for spherical abberation and by placing the corrector at the radius of curvature of the primary also fully coma corrected. If you look at the design of a Schmidt camera you'll find the corrector plate is located at the radius of curvature of the primary. At this position it is fully corrected for coma but you need an oversized primary. This also applies to Schmidt Cass optics as well. The position of the corrector has much less of an effect on spherical aberration thou. So the position of the corrector has a much larger range of position that it can be placed with the same curve on it's surface and not effect the spherical correction of the system So when you have a typical Schmdit Cass, you balance how much coma is in the system by the position of the corrector and also how much aspheric correction you place on the secondary. The point of SCB's write up is that this can be done with standard SCT components. The primary would need to be oversized - but only to avoid vignetting. The coma would still be corrected using standard components, but there would be some vignetting - but I don't think much. But in order to have good performance on axis, the corrector would need to be well centered and aligned - and the secondary well collimated. The basic theory applies to custom SCT vs commerical ones so moving the corrector forward will work to reduce coma. The piece of information that got confused is the which way the corrector needs to go, which is away from the primary. Thanks everyone for the stimulating discussion. David: Thanks for the pic! - and the insight that the Schmidt corrector in the SCB design is not placed at the exact ROC in order to balance the correction of coma vs. field illumination. To me this looks like it could be a pretty straightforward mechanical mod with minimal cost: No optical work is required, and a simple mechanical design maintaining the existing mirror cell(s) and spacings could easily be implemented. The pic provided by David illustrates the Schmidt corrector could be mounted on parallel truss tubes wherein its position could be varied slightly to find the best overall position – although as noted this appears to not be a critical distance. With regard to compactness, the tube length has gone from f2 to about an f3 design - not too significant im my opinion. A new C14 Edge HD is $5800 USD (no discounts appear available). I could perhaps get ~ $2500 USD for my used standard C14. I think that for the ~ $3300 differential, I could spend less than $1000 for truss tubes and a curved spider assembly, and achieve what appears to be ~ 80% or more of the performance of the Edge HD with respect to coma reduction, with equal or better on-axis performance, and no diffraction spikes. 2) Secondary mirror mounting fixture. Frank makes excellent points regarding the centering and alignment of the components. A spider mounted secondary could be stable, but would need to be aligned prior to fitting the secondary, unless an open tube design was chosen. A corrector plate on an open structure would quite possibly be more susceptible to dew than one mounted on the end of a closed tube. By choosing a closed tube, I see the following issues... Firstly, the secondary, if mounted on an extension from the corrector, could place unwanted stress on this fragile element (though the Fastar camera mount system has been successful). Secondly, as mentioned before, the collimation mechanism must be modified, and still be stable over time and temperature changes. Thirdly, substitution of the tube will necessarily require careful realignment of the primary mirror to the tube axis, which is normally "factory set" and removed from the equation in the common or garden C8. Scope performance is very susceptible to minor misalignments of this low f/ratio element. All this comes before we consider the finesse required in the design to take advantage of the desired improvements. Issues like thermal stability (focus shift, collimation etc.) weight, flexure, could easily wipe out any gains. What the authors in the Telescope Eyepiece and Astrographs are states is to keep the secondary in it's original position and the move the corrector away from the primary not towards it. Yes, but the OP stated he was going to move the corrector towards the primary, not away from it. My drawing was based on this concept. And it was addressed to Ed, specifically to explain why one would not want to place a secondary ouside of the corrector without using a spider. I had never seen a design like the one the OP talked about (corrector closer to the mirror than the secondary) so did not understand how this could be done any way but with a spider to support the secondary. I am still at a loss as to where the equal or better on axis performance will come from. More obstruction, and otherwise, no change in the optical prescription. Given the extra obstruction (small, but more obstruction is more obstruction) and the already high level of optical correction of the standard design, I just can't see where the improvement would come from. If you were willing to run unbaffled (people do this of course) you could perhaps reduce the diameter of the secondary a bit, but for an f/10 system the geometry is more or less fixed. I am all for you building it though. The instrument in the picture is quite lovely and I am sure almost as good as a Newtonian with a coma corrector. No - he said to move it toward the primary's radius of curvature, which is the normal place for a Schmidt corrector to live - and serve as the entrance pupil. A compact sct intentionally moves it in toward the primary to make it compact at the expense of introducing coma. Schmidt astro-cameras have a narrow front, large primary, and long tube as a result - but they also have no coma. And they still have field curvature, originally fixed by using curved film. Making a telescope long to improve the image may seem like a reasonable trade off - but it does get heavier, requires a bigger mount, and is more susceptible to wind. You could similarly improve the performance of a single lens refractor by going the way of Hevelius. The simplest approach is to move the corrector forward and then aspherize the secondary or make a new one that you aspherize. This will allow you to fully correct for coma as well. The reason why aspheric surface are avoided in mass produced commerical optics is that it is cheaper to make multiple elements with spherical surfaces then fewer ones with aspherical surfaces. A good example is to compare the coma performance in a two mirror Cassigrain systems. A Dall Kirkham has an elliptical primary and a spherical secondary which is easy to make but poor coma correction. A Classic Cass has a parabolic primary and hyberbolic secondary. Now both surfaces are aspheric but much better coma correction. A Ritchey Chretien has both surface Hyberbolic so the most difficult to make but the best correction for coma. If you go back to a simpler design that has more coma but cheaper to make, the commerical fix is to throw a corrector in the light path that it made of spherical lenses. If you are going to rework the secondary, why touch the tube or change the position of the corrector. The shorter tube is desired and is lighter. The only surface change in the ACF is the secondary mirror. So the SCT can be made the same by reworking the secondary. That may work very well. One would need to raytrace the design to see what the effect would be of just aspherize the secondary vs changing it's radius and also aspherizing it. Then compare that to moving the corrector and leaving the radius the same on the secondary but adding some correction to it. The level of aspheric correction should be less when it is combined with moving the corrector away from the primary. This will make it easier to refigure or make a new one. It all comes down to what is the level of performance gain vs the amount of work. My original statement was to displace the Schmidt corrector "toward the primary’s radius of curvature" -- which would be a point in front of the primary twice as far as it's focal length, as opposed to the factory position of the corrector, which is approximately just short of the focal length. My point about the on-axis correction is based on the Strehl diagrams of the SCB SCT variants analysis. It is a small but clear difference - 1.00 on axis (repsaced) vs. 0.92 (EdgeHD), as shown in the ZEMAX diagrams. The salient point for me is that by simply respacing the corrector a relatively small amount, you get marked improvement in performance from the garden variety SCT. In fact, shifting the Schmidt corrector seems to offer better Strehl perfromance than the Meade "advanced coma-free" design that uses the aspherized secondary. I note also that per Company 7, Celestron’s spherical secondary has “final hand figuring yields a slight asphere.” So this may already be sufficient to suppress coma to a greater degree. While additional aspherization might help post respacing, the simple respacing seems to get very close the HD. I think that raytracing with catalog lenses might be an easier way to go, and would possibly offer less field curvature than additional aspherization of the secondary. My SCT is coma free, the stars at the edge of the field are sharp and round. I still have curvature, which I am working to remove. I did this using a four element corrector lens and changing the spacing of the lenses inside the corrector. It now requires about 1/30th of a turn on the focus knob to bring the edge into total focus compared to the center. I am hoping to correct this as well but it takes time to respace and test. It is 10 times better than the stock F/6.3 unit. If I understand telescope-optics.net, http://www.telescope...aberrations.htm, coma is reduced because the stop is moved closer to the center of curvature. The corrector is also the stop, but one can put a stop in front of the corrector too. For instance in a dew shield.